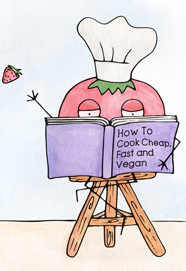 The Vegan Stoner is a collection of delightfully illustrated recipes produced by the same folks who run the eponymous blog. They may call it stoner food but I refer to it as bachelor food. It is the type of thing that I ate when I was living by myself and my silverware drawer was full of plastic cutlery that I had stolen from Starbucks. Or rather, it’s what I wish I ate. At that time I did not have the innate sense of how to create something both tasteful and healthy. The Stoner crew, Sarah Conrique and Graham I. Haynes, not only manage that here with lentil topped baked potatoes and carrot pizza but also manage to do it in 7 sentences or less. It’s a cookbook that can get daily use, the kind you grab when you realize you only have a half empty container of almond milk, ketchup, and 4 items in the cupboard and you’re hungry, now! Surely, this is a situation stoners often find themselves in, but, let’s be honest, they are by no means the only ones. A loyal fan of the blog will recognize a few of the recipes here. The published book, however, also treats you to the ganja-fueled adventures of a cohabitating group of vegetables. In each chapter there are a few scenes of bead-wearing mushroom relaxing on a bean bag or a grumpy pear smothering his emotions with food. In addition to learning what my life would be like if all of my friends were sentient produce, I also got a glimpse of something more relevant: how much our culture has progressed into foodieism. I own another cookbook targeted at a similar crowd called the Starving Students Vegetarian Cookbook. You know what type of recipes it includes? Beans on toast. In this one you get a vegan Hollandaise Benedict. I myself am an unabashed foodie. I realize it is politically problematic, but I can’t deny who I am. And despite its reliance on canned goods and shortcuts, the Vegan Stoner Cookbook is one I would be proud to have in my kitchen. If nothing else, it’s the cutest reference for rice and bean cooking times and water ratios in existence. You can sample the Zucchini Bean Balls and Baked Banana Cake from their book, as well as their adorable drawings, on their blog. This entry was posted in Cookbooks, Reviews and tagged 420, American, canned goods, illustration, sentient produce, vegan. Bookmark the permalink.